The first two weeks of October at Fish Point were a study in contrasts, with some of the largest numbers of migrants ever recorded at the site moving through the area from the 1st – 8 th , followed by a significant drop-off during the second week of October. Though not the only measure, the average weekly catch-rates best illustrate the difference. From October 1st – 8 th a total of 690 birds were captured in 293 net-hours, for an average catch-rate of 2.36 birds/nethour, compared to 132 birds banded from the 9th – 15th in 270 net-hours (0.49 birds/net-hour). While the catch-rate during the second week indicates that it wasn’t exactly slow, it felt that way after all the activity of the previous week – the catch-rate during the first week was almost five times greater than from the 9th – 15th . The 1st of October set the pace for the remainder of the week when 53 species were recorded and 116 birds of twenty-two species were captured. Kinglets and thrushes dominated, but there was a nice variety of others observed including 251 Blue Jays recorded on the census, 60 White-throated Sparrows, Red-eyed and Blue-headed Vireos, 10 warbler species, moderate numbers of creepers and Winter Wrens, and a few late Tree Swallows. October 2nd was equally busy – fewer species were noted (43), but the netting area was active again, with 116 birds of twenty-five species banded. The first Orange-crowned Warbler of the fall was one of eight warbler species captured on the day. Activity tapered off the next day, with just 36 species tallied in the official count area, but it was a brief pause. The next day, October 4th, was fairly active on the morning census down to the tip and back, with about fifty kinglets recorded along with small number of four warbler species, a group of 44 Blue Jays, and ones-an-twos of creepers, Winter Wrens, and phoebes. Given these numbers – and while there’s often a considerable difference between the totals on the walk and in the netting area – it was quite a surprise to find Sumiko and Sachiko having a very busy time with the banding. All told, 158 birds of nineteen species were captured on the 4th in just thirty-six net-hours (4.40 birds/net-hour). 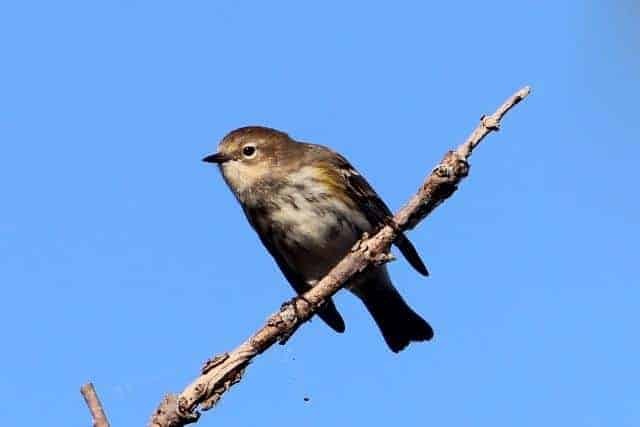 More than half of the birds were kinglets (66 Golden-crowned and 20 Ruby-crowned), but lots of other species were banded in smaller numbers including White-throated Sparrow (15 banded), Brown Creeper (14) Swainson’s Thrush (11), up to half-adozen each of Eastern Phoebe, Blue-headed Vireo, Gray-cheeked and Hermit Thrush, and six warbler species. The 5th was a near repeat, with 55 species recorded and 141 birds of twentyone species banded (3.81 birds/net-hour). Species observed included Common Loons and some lingering Common Terns on the lake, 4 raptor species, lots of Northern Flickers and Blue Jays, catbirds and thrashers, and 10 warblers species, including the season’s third Northern Parula. Banding highlights on the day included 5 captured Blue-headed Vireos, 18 more Brown Creepers, 4 thrush species, 8 Nashville Warblers, and another 72 kinglets. Migration activity finally tapered off and it was relatively quiet on the 6th when 44 species were recorded and 24 birds banded. A couple of fall ‘firsts’ made an appearance – American Bittern and Red-shouldered Hawk – and there were lots of Blue Jays (242) flying south off the point on census, but kinglet and thrush numbers were much reduced. This pace continued up to the 10th – there were still quite few landbirds around, with 48 individuals captured on the 7th and 56 on the 10th, along with 470 Blue Jays on the 8th – but this didn’t last. By October 12th numbers were reduced to 32 species recorded on the day and a mere four birds captured in 45 net-hours (0.08 birds/net-hour). Activity picked up slightly on the last two days of the summary period, with 48 species observed on the 14th, but it was a far cry from the numbers recorded at the start of the month. As for the first week, the number of banded birds and the average catch-rate represents the fifth highest weekly totals at the station in thirteen years of operation. As an aside, it’s worth pointing out that PIBO operates less than half the number of daily net-hours of any migration or banding site in North America, and less than a third of many stations. In this respect, banding totals themselves don’t provide much information apart from how much effort has gone in to catching birds, and, as such, are often misleading i.e. a banding station that captures 200 birds in a day leaves the impression that it is busier than a station that captures 100 birds, yet the opposite is true if the first site captures 200 birds in 100 net-hours (2.0 birds/net-hour) and the second site bands 100 birds in 40 net-hours (2.5 birds/net-hour). So, while the annual banding totals at many other sites are often much higher than PIBO’s, this is almost entirely due to the large-scale effort at many stations to catch as many birds as possible, rather than the average catch-rate, which reflects the actual number of birds in the area. PIBO’s next migration summary will be posted on November 3rd .